Lee Selby was pleased with his victory over Romulo Koasicha on Saturday that moved him closer to a world title shot. The Welsh featherweight was an overwhelming points winner over his Mexican opponent in their WBC international title eliminator. "I thought it was a good display of boxing. He was a typical Mexican, kept coming forward pressuring me so I had to box on the back foot," Selby said. "I got cut so I didn't want to risk anything, so I kept it clean." Selby used his skills well to nullify the best that Koasicha could throw at him, surviving the mini-crisis of a cut to his right eye mid-fight and keeping his dangerous opponent at arm's length. 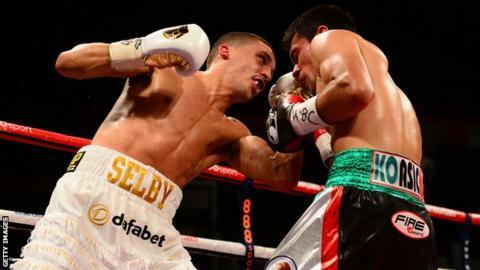 "I think I won every round... with my fitness and boxing ability I managed to out-box him," Selby said. Selby's manager, Chris Sanigar, suggested after the fight at Cardiff's Motorpoint Arena that Selby may have to get used to fighting Mexican opponents in future. WBC champion Jhonny Gonzalez remains a firm future target, although compatriot Abner Mares - who Gonzalez beat last August - is another exciting potential match-up. "We're hoping to get Lee into a final eliminator for the WBC title and that's what we're hoping for his next fight," Sanigar said. "We want to see what Abner Mares does; we'd get more credit for beating somebody like Abner Mares than Jhonny Gonzalez. "So we've just got to wait and see. Lee has just got to continue training, continue improving and then he'll be ready for anybody." Selby said he would force himself to rest after his victory before resuming training, but then expected to be back in action within five months.